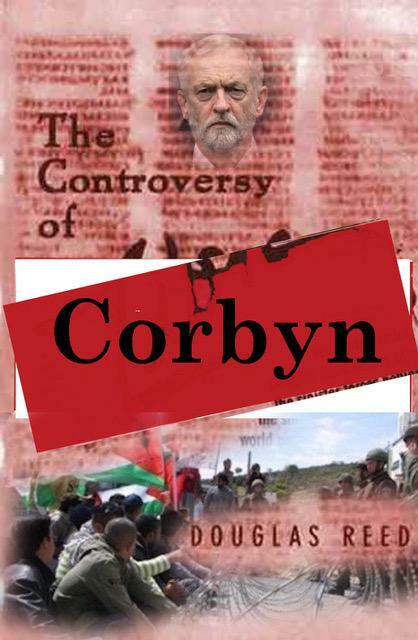 Although the following quotation is from an old text that refers to an earlier era and different geo-political conditions, it provides an impeccable analysis of the current Zionist campaign against Jeremy Corbyn, the Labour Party and the false alarm of antisemitsm. “The ghettoized Ashkenazim (both in their Communist and their Zionist organizations) were inspired to obstruct emancipation by every possible device (including assassination in the last resort) while the story of their persecution was hammered, as an intimidatory warning, into the consciousness of the Western Jews and, as a rightful claim for succour, into that of the Christian West. The Gentile politicians of the West presented these fictions to their peoples as truth, for they had found that powerful Jews, in all countries, were able to assist parties favoured by them with money, press support and votes; the return they required was support for the cause of the “persecuted” Jews in Russia and for the ‘return’ to Palestine. In effect this meant that politicians who sought these favours had to subordinate national interest to two causes ultimately destructive of all nation-states: the revolution (communism) and the ambition to acquire territory for the dominant race (Zionism).”* Douglas Reed 1955. According to Douglas Reed the threat of antisemitism is designed primarily as a means to prevent Jewish assimilation. In The Wandering Who? I show that the fear of assimilation is not exclusive to Zionism, the Jewish political left and Jewish anti Zionism serve the same objective. By giving a place in the Jewish world to ethically inclined Jews they prevent such Jews from integrating with humanity as equals. The mechanism is straight forward: ‘You do not have to become a Goy in order to oppose Israeli criminality, you can just join JVP and oppose Israel ‘as a Jew.’ Similarly, you don’t have to oppose Corbyn’s detractors as an ordinary Labour member, you are better off celebrating your Jewish privilege and support Corbyn as a member of Jews for Jeremy or Jewish Voice for Labour (JVL). Exclusively Jewish ‘dissenting’ bodies serve another crucial purpose: they operate to exclude gentiles from sensitive Jew-related discourse. Palestine solidarity has been dominated by Jewish ‘anti’ Zionist political bodies for more than a decade. These bodies have never been interested in solving the Palestinian plight; they have never echoed the Palestinian core demand for the right of return. Instead they have called for the ‘end of the occupation (practically legitimizing the Jewish State within pre 67 lines),’ the ‘Two States Solution,’ and BDS measures against Israel. Instead of fighting for the Palestinians’ right to return to their land, they have produced a noisy exchange between Zionists and the so-called ‘anti’s’ over Jews’ right to BDS. Thanks to the Jewish solidarity groups the discourse of the oppressed has been shaped by the sensitivities of the oppressor. The same dynamic has been affecting Corbyn’s support campaign. Britain’s NO 1 anti racist doesn’t need a ‘kosher certificate’; from a supportive Jewish lobby. He doesn’t need the ‘as a Jew, I believe in Jeremy’ declarations. The same dynamic that obliterated the Palestinian Solidarity movement has so far had a disastrous effect on Corbyn’s supporters. They foolishly positioned the ‘good Jews’ at the forefront of their campaign and let the campaign for the leader of the largest British national party be reduced to an internal Jewish spat in a greater Judeo-centric battle against assimilation. Reed continues, “The Gentile politicians of the West presented these fictions (of Jewish persecution) to their peoples as truth.” This is an unfortunately apt description of Home Secretary Sajid Javid’s call for Corbyn’s resignation over the ‘antisemitism’ crisis. Our PM, Theresa May, also accused Jeremy Corbyn of allowing anti-Semitism to ‘run rife’ in Labour. But why do they openly act this way? Do they really believe that antisemitism is ‘rife’ in the UK? Back in 1955, decades before AIPAC was formed and the Conservative Friends of Israel was exposed as Israel’s long arm, Reed provided a possible explanation of current British political maneuvering. They do it because they “found that powerful Jews, in all countries, were able to assist parties favoured by them with money, press support and votes.” Reed argues that Western politicians who accept the lobby’s favours scarify their national interests. This observation from 1955 explains why Britain and the USA have been fighting Zio-con wars and the prospect of world peace is progressively fading away. When Douglas Reed died in 1976 his entire prolific career as a journalist and a commentator was dismissed. The Times‘ obituary condemned him as a ‘virulent anti-Semite.’ During my intellectual career I have learned that too often it is the so called ‘bigots,’ ‘anti-Semites’ and ‘racists’ who understand the world and its meaning better and ahead of anyone else. I guess that the take home message is: when they attempt to burn a book, make sure that this text is at the top of the pile next to your bed. If they attempt to silence a voice, attend to this voice before you do anything else. Because Jewish power is the power to obliterate the discussion on Jewish power.